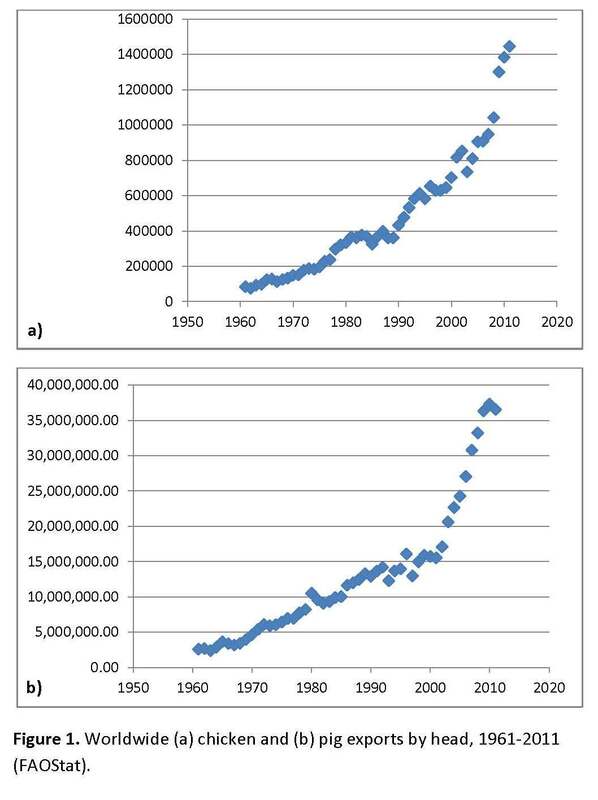 To get a handle on the world’s traffic in livestock for a paper I’m co-authoring, I graphed FAOSTAT data on global live chicken and pig exports by head, 1961-2011. The time series appear to track geographically lengthening production-demand discrepancies–areas of high production meeting demands elsewhere. Globalization exploded in chickens by 1990–not long preceding bird flu H5N1–and, after a starting wobble in the 1990s led by the United States and NAFTA, in pigs by 2000. Indeed, even excluding illegal trade the stats don’t pick up, pig exports more than doubled by the end of the decade, when swine flu H1N1 (2009) appeared with genomic segments from influenzas circulating among pig populations in both Eurasia and North America. New agricultural ressortants appear to be accumulating at an accelerating pace since, including H1N1v, H1N2v, H3N2v, H7N9, and now a new series confirmed last week, H6N1.